As the media industry forges on into a world that continues to prioritize the traditional set-top box, companies like Ooyala are in position to build media- and streaming-support backends to help content-rights holders maximize their experiences in a digital space. At NAB 2018, the company demonstrated its Flex Media Platform, which is an open and extensible video-production and -delivery platform that simplifies and streamlines the process of managing, curating, orchestrating, publishing, analyzing, and monetizing video content. 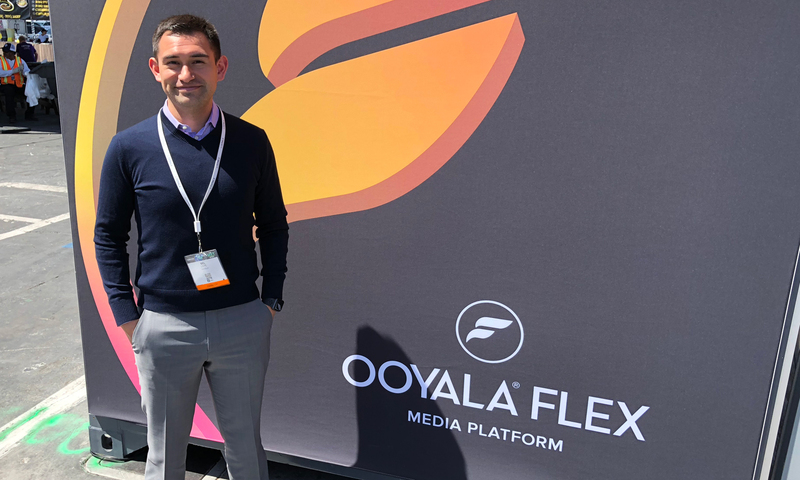 SVG spoke with Ooyala’s founder/CTO Belsasar Lepe about how he sees streaming technology evolving and what he learned at the big show in Vegas. First off, tell us more about Flex Media Platform and how it applies to the sports audience. Flex Media Platform is an evolution of Flex, which is one of the products that we acquired in 2015. It really plays into this world of the content arms race that we’re seeing. It doesn’t matter if you are in sports or broader media entertainment or an enterprise. Just the sheer amount of content that’s being produced is escalating. So Flex Media Platform helps our customers be more efficient with content production, distribution, and digital-video playout. For Intel Sports, for instance, we worked with them as part of the 2018 Winter Olympics. We provided the foundational backend for capturing virtual-reality content at more than 10 different sites across South Korea. That went into our media-asset–management system, and, as the content came in, it was tagged with the relevant rights, the relevant metadata so that 12 broadcasting-rights holders could go in and see the content that was relevant to them. If you were streaming the Olympics here in the States through the NBC Sports app, that was coming through our aggregation and distribution process. We are finding that many of these entities have made significant investments in nonlinear-editing suites, maybe a media-asset–management system, and they are thinking very best of breed. But when you go and collect a vendor landscape of several different systems, how do you bring them together? Our viewpoint is that we can bring a platform that will bring that together. We’re helping orchestrate that overall workflow. How do clients, specifically in sports, get integrated when they agree to partner with you, and how does it impact their streaming experiences? Usually, the first phase for these folks is to get it up and running: let’s have what we have running, just more efficiently. As we look to the second and third phase, that’s where we start to do some really interesting things, like bringing in a stats feed, doing more automated generation of highlights, or sending content over to Microsoft’s Video Indexer and doing automated tagging of athletes and plays. I think you’re going to see a lot more of that stuff. Every other year [is a big year] in sports, and we’re in one of those years. With the World Cup in June, I’m sure we’re going to see a bunch of big steps being taken around technology, testing of new formats, etc. What’s your take on NAB 2018? Anything catch your eye as you got the chance to walk around? There’s a lot of people talking about this notion of the content supply chain. People are starting to think more about how they are going to compete with Fox, who just acquired the Thursday Night Football rights. How can I do more with the content that I have? The rights I do have I’m going to send to television, but how can I create a fan experience with the pregame interviews? There’s a lot of focus around consolidating and connecting the content supply chain. There’s a lot of talk around virtual reality and whether it’s real or it’s not. I think a lot of people are really down on virtual reality. That’s something that’s a surprise for us because, across our customer footprint, we’re still seeing a lot of testing happening in VR and 360. What do you think of the rise in popularity of connected devices? A lot is made of mobile, but there’s a slice of the pie that’s actually migrating back to the television screen and streaming there. We released our Q4 Video Index [earlier this month], and it’s interesting that the publishing metrics that we publish show this steady march towards mobile. We saw 66% of all video views occurring on a mobile device. One of the trends we will probably report on in the next quarter is how much of that is casting back to the big-screen TV. I don’t think there was a migration away from the big-screen TV, per se, but a migration away from the set-top box. If a user can cast to the big-screen TV, then the emerging audience, I think, is definitely going to do that.